When it comes to snacks I am not, as a rule, prone to hanging around. The exception was in St.Mawes last week when the woman behind the counter at the Bakery On The Quay said that despite having sold out of pasties she would be receiving a fresh supply in a quarter of an hour or so. She said the bakery was just around the corner and if I planned to come back she would put a couple aside. Ordinarily at that point I would have sought something alternative to eat elsewhere. Kim was dropping off a new image at the Square Gallery that day and in the past on such errands we’ve lunched well at The Watch House restaurant where the food is always tasty and they are happy for Asta to join us. 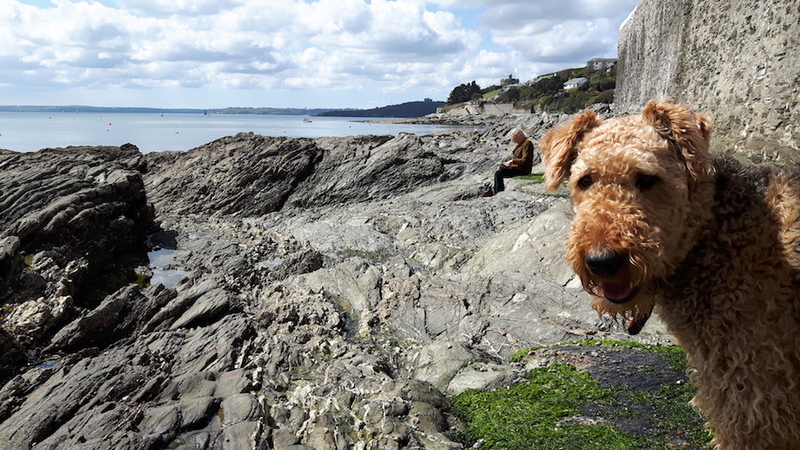 But that day being warm and bright we fancied lunching al fresco amid the rock pools just along from The Quay where the ferries from Falmouth pull up. Just about to turn on my heel my attention was drawn by a stack of Belgian Buns in the window. 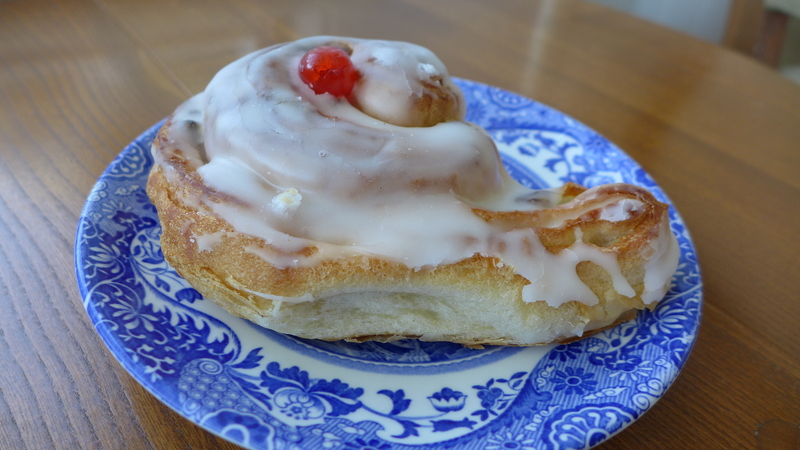 I don’t mind admitting that along with Eccles Cakes and those aristocratic Mille Fuilles I find a Belgian Buns, iced sultana pastries with a single maraschino cherry on the top, impossible to resist. Unfashionable in recent years most of those I’ve eaten this past decade have come from traditional high street bakeries where price and volume are prefered to flavour and aesthetics. I have a regular supplier in Truro whom I inadvertently embarrassed some months past. When I remarked that her Belgian Buns Buns there were the biggest I’d ever seen the woman behind the counter, well endowered by any stretch of the imagination, blushed a deeper red than the maraschino. But I digress. The Belgian Bun I bought from the Quay Bakery was quite delicious; possibly the finest either Kim or myself, or Asta for that matter, have ever eaten. About six inches in diameter and packed with sultanas and what seemed to be just a hint of almond. The outside of the coil golden brown and crunchy with the inside that perfect balance of firmness and moisture. The icing, unlike those sticky ones that get all over your fingers, was dry and crisp. True to the sales lady’s word the next batch of pasties were delivered by the baker’s wife shortly. The baker, a local man, is called Patrick Stacey and he inherited the business from his father who sadly passed away in his 50s. I learnt this from Patrick’s twin sister who just happened to be in the Bakery On The Quay as I waited. It was worth the wait. 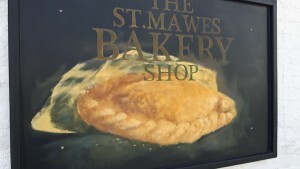 The pasties would be classified in Padstow as large, a good nine inches in length. The pastry firm and light and within the crimped pastry case thumb sized slices of potato and onion and lumps of skirt the size of walnuts. A bit salty perhaps, turbocharging the flavour, but that didn’t matter because to dampen down out taste buds I’d bought a second Belgian Bun. Take it from me you could do a lot worse than drive to St.Mawes. Invest in one of Kim’s paintings on silk at the Square Gallery and lunch on the shingle beach with Patrick Stacey’s superb pasties (£3.50) and Belgian Buns (£1.20). 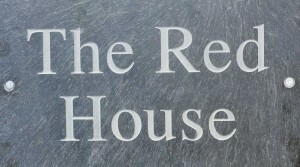 Bakery On The Quay, The Quay, St. Mawes, TR2 5DW.